Our family has an annual bonfire when we gather at my mom's in OC for family vacation. It's one of the highlights of our week together. This year we had to postpone due to rain, the Town of OC was very accommodating with the rescheduling. The ability to get the permit online would certainly simplify the process for us. Has to be one of the most memorable times we have had!! Cleaned up everything for like a 100 yard radius around our site. Don't want to ever give OCMD a reason to stop this! We even had fun with the city employees when we dropped off our application! I was invited to join my dance group at a beach bonfire this summer! It seemed like a lot of work but very worth it! It was one of my favorite beach nights of the summer!!! 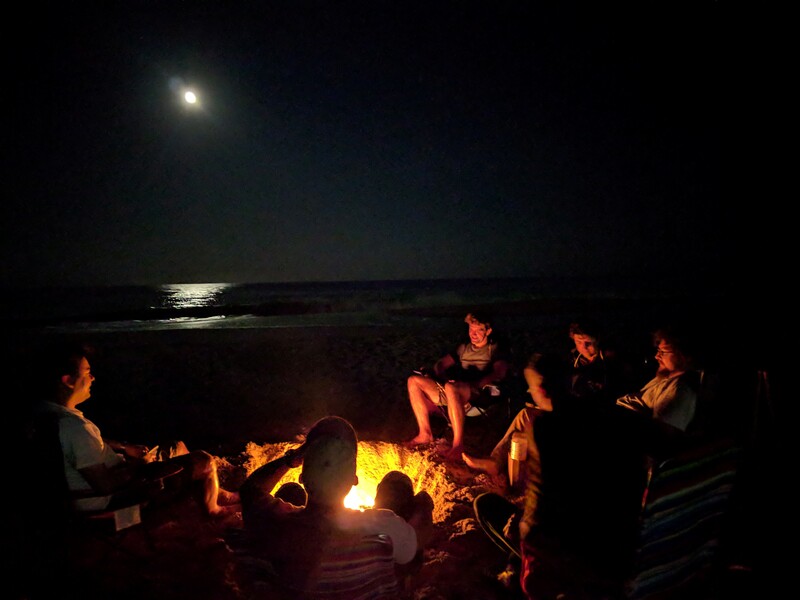 We had the fire, full moon, great friends, and the Atlantic as back ground music. Many thanks to you for all of your help with the permit. Memories are truly made in OCMD. Thanks it meant more than can be imagined. Everyone had a blast and we will definitely have another bonfire in 2018! It was such a nice way to get together with our "beach neighbors". My friends and I have been coming to Ocean City for years but did our first bonfire back in January 2017. Since then, we've had three -- one each time we visit, usually on the last night of our stay. It's such a great way to wind down after a week full of fun OC activities, and so long as it's not raining, doing them in the winter is just as good as the summer. Beach bonfires are now part of our Ocean City tradition and I look forward to many more fires to come. THANK YOU for moving the process online. I've wasted too many hours sitting in the budget office waiting for the credit card machine to work. Going online will save me valuable vacation time. Thanks!